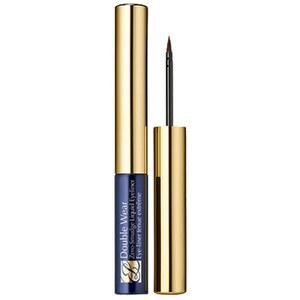 Ultra-fine: Slim tip defines eyes with glide-on precision. Thin: Use the flat wedge tip to create a classic line. Thick: Turn the flat wedge tip on its side for thick, full-on drama. Take your look from subtle daytime elegance to amped-up evening glamour, all with one must-have liner. Waterproof, smudge-proof and flake-proof formula. Fragrance free and ophthalmologist-tested, the Estée Lauder Little Black Liner Thick. Thin. Ultra-Fine in 'Onyx' allows you to create a range of smouldering looks with ease and precision. Its double-ended silhouette with thick and thin tips lends you the ultimate control; create smoky, dramatic night-time looks or subtle, 50's inspired flicks for vintage appeal - all without smudging or cracking.